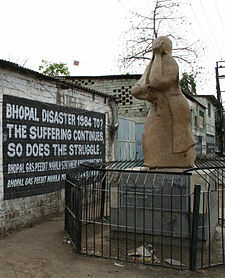 ↑ "Bhopal trial: Eight convicted over India gas disaster". BBC News. 7 June 2010. Archived from the original on 7 June 2010. සම්ප්‍රවේශය 7 June 2010. මේ පිටුව අන්තිමට සැකසුවේ 23 ඔක්තෝබර් 2017 දින දී, 09:35 වේලාවෙහිදීය.